Get ready for a whole new you! If you have found our website you probably have been experiencing a gas or bloating issue or maybe both. We here at SciTrition believe that a healthy digestive system is paramount to a healthy, energetic and happy life and that Science (Sci) combined with Nutrition (Trition) can help people live better lives. People who take the initiative and time to correct imbalances in their digestive system are often rewarded with incredible benefits. Living and suffering with abdominal gas and the pain and bloated swelling that comes with it, is no way to live. An end to feeling tired after eating, more energy, relief from symptoms of Irritable Bowel Syndrome (IBS), being able to enjoy foods that once caused bloating, relief from stomach discomfort, relief from gas and bloat, help with weight loss and a diminished beer belly. The jury is still out on these claims but poor digestion and the resulting poor absorption of nutrients and/or toxic rotting food in the digestive tract have even been linked to depression, brain fog, memory problems, concentration problems, rashes and acne. Good health begins in the digestive system, believe it! Our goal is to provide top quality, natural ingredients and ground breaking formulations designed to address the causes of abdominal bloating and excessive gas. Vitamins and nutritional supplements can be very expensive. Affordable brands are often low potency and contain inferior ingredients, making them a waste of time and money. Today you can purchase directly from SciTrition and cut out the high mark-ups of distributors and retailers. Our goal is to provide the very best supplements at affordable prices so that more people can enjoy the enormous life changing benefits of high quality nutritional supplements. 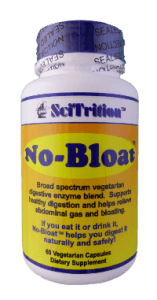 No-Bloat™ is our flagship product. It’s a unique and very wide spectrum, plant based digestive enzyme blend, creating an incredible formulation that helps stop stomach bloating and gas pain by helping you digest food much more efficiently. Be it beer, pizza and wings, too much Thanksgiving dinner or an ice cream binge; once you experience the effectiveness of No-Bloat™ you will never want to be without it. Probiotic Mega Blend™ is a wide spectrum beneficial bacteria supplement that helps re-establish a healthy balance of bacteria in the digestive tract. Millions of Americans are walking around with a system heavily loaded with bad bacteria and woefully lacking beneficial, (good) bacteria. For some people Candida and/or parasites may be adding to their gas and bloating problems. Yeast and Parasite Colon Cleanse™ is a proprietary Blend of 16 natural extracts, botanicals and herbs trusted for decades to help in the battle against yeast overgrowth and parasites, plus mild colon cleansing ingredients. Coming soon! Check back for exciting new SciTrition products in development and available soon! * We cannot guarantee specific results like those in our customer’s testimonials, as your results can vary. However we do offer a generous 90 day money back guarantee if you are not 100% happy with your personal results.